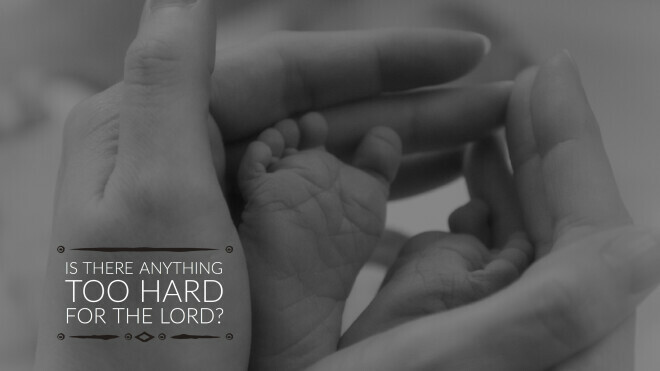 Home » Blog » Is There Anything Too Hard for the Lord? First, it is obvious, but necessary to note, that this question is from God to Abraham, not the other way around. If Abraham posed this question to God, he might be suggesting that God is either indifferent to his situation or unable to do anything about it. However, this question originates from God. God’s words were designed to move Abraham’s thoughts from his personal need to “the incomparable nature and works of the Lord” (Ross, 339). Undoubtedly, the question caused Abraham to rehearse the miraculous things God had done for him since he left Ur of the Chaldeans (Gen 11:31). If God could bring him hundreds of miles from his original home and lavish numerous physical blessings upon him, is he not also able to give him a child? Second, the context of Genesis 18 is Abraham and Sarah’s childless misery. Many years earlier, God had promised a son to them through their union (Gen 15:1-4), but Sarah was barren and beyond childbearing years (18:11). Into this context God inserts himself and again promises a son to this couple by the following year! This immediately seems impossible, even “laughable” (18:12). So God fires this penetrating question to Abraham: “Is anything too hard for me?” It is notable that the Hebrew term God used – translated “hard” – means “surpassing, extraordinary, wonderful” (Ross, 344). Essentially, God is confronting this childless couple with this question: Do you think I am up to the task of doing something extraordinary?